Helicentre Aviation have placed an order for the ﬁfth Cabri G2 to join their training academy ﬂeet at Leicester Airport. The order was signed for this week at the company’s operating base where Andy Moorhouse of Cotswold Helicopter Centre, the UK Guimbal distributor, met with Helicentre Aviation directors Chris Line and Sarah Bowen. Helicentre Aviation currently operates two Cabri G2 helicopters and ﬂew a record 185 hours on type last month alone, ranging from ab-initio PPL training to Flight Instructor courses. The company has ﬂown over 1,300 Cabri ﬂeet hours since they began operating the type in late 2012. Delivery of their third ﬂeet addition is expected by late March, with the fourth arriving in August and the latest addition anticipated by January 2015. 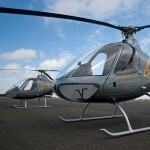 Cotswold Helicopter Centre are thrilled with Helicentre Aviation’s utilisation of the Guimbal product. “We are really proud to be associated with the busiest helicopter ﬂight training organisation in the UK, and we are so pleased that they have decided to order yet another Cabri G2” Andy Moorhouse commented. Helicentre Aviation have recently invested over half a million pounds into a new heliport complex and are due to award ﬁve training scholarships in 2014 to help the successful candidates fund their professional helicopter pilot training. Established in 2001, Helicentre Aviation Ltd. has trained and supplied a signiﬁcant number of helicopter pilots to the industry and their mission statement advocates creating opportunities for new pilots by helping them achieve their ﬁrst break in the training and charter industry. Helicentre Aviation’s key personnel have over 100 years combined professional expertise ﬂying helicopters and providing private, professional, and specialist training, helicopter charter, and utility and aerial services. 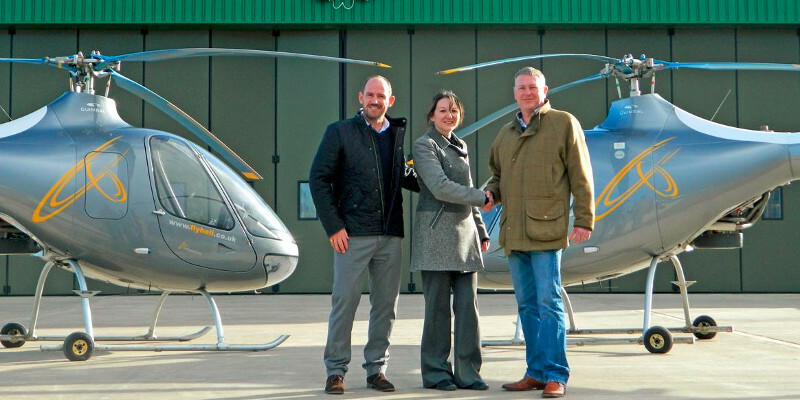 From left – Chris Line and Sarah Bowen from Helicentre Aviation with Andy Moorhouse of Cotswold Helicopter Centre.